Probably leading Trade Union members are too tuckered out from the last round of demonstrations against the former PP administration. It could be that the MOU between the PNM and the JTUM had some clauses that the public are not privy to. Or maybe demonstrating against the PNM can be construed as an endorsement for the UNC. 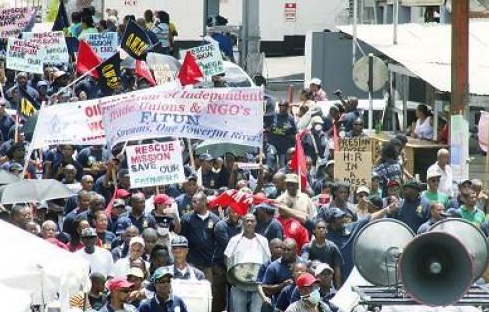 Whatever the cause, it is time that Trade Union leaders wake up and start to shake out of their lethargy for the good of Trinidad & Tobago. We can name a number of Government Ministers and issues that point to their failures. The Minister of National Security has failed in violent crime prevention. The Minister of Tourism and the Minister of Works and Transport has failed in their mandate to provide an efficient, reliable and regular service between the islands. The Minister of Public Utilities has failed in reforming T&TEC and WASA. The Minister of Labour, Small and Micro-enterprises has failed to stabilize the job market and has also failed to provide proper mechanisms for improved Industrial Relations. The Minister of Education has missteps that are too numerous to mention. The Attorney General too has failed to deliver on many issues so much so his agenda and competence have been questionable. Ultimately, the Prime Minister has failed to properly manage his team. Where are the voices of the TTPSWA (Police Association) on National Security issues as it pertains to violent crime? Where is the voice of the SWWTU on the sea bridge crisis? Where are the rants and shouts from the PSA and the OWTU on the issues affecting WASA and T&TEC? Only the CWU has taken the Labour Minister, as well as others who may stand in the way of workers’ rights such as the Minister of Tourism, to task in a meaningful way. How are we not hearing "Keith Rowley and the PNM must go!" just as in the case with the Angelin platform; and it can be argued successfully that Keith Rowley is a threat to the Health and Safety of the nation. If the Trade Union Movement believes that Labour Day 2017 is where they are going to launch some offensive in the interest of the nation, they will be disappointed by the numbers. The Trinbagonian citizen is interested in gun-play rather than gun-talk these days. If we are to hit the streets, it must not be a one day flash in the pan. If we are to be reduced to the slacktivist exercise of delivering letters without follow up action, we ain't in that! We want when we talk, somebody listens and starts acting. As Trade Union members the first people who must listen to our issues and act to get them resolved, in the interest of national progress, are the leaders of our various Trade Unions.